"Jesus … said to his mother: He is your son. Then he said to the disciple: She is your mother. From that time the disciple took her to live in his home." [Jn 19: 26-27]. The last popes have spoken favorably of the consecration to Mary. John Paul II has manifested his opinion like this: "How could we live our Baptism without contemplating Mary, the blessed among women, who accepted so well the gift of God? It is Christ who gave her to us as a mother. In fact, He gave her to the Church as a mother. ……… Every Catholic spontaneously consecrates himself to her, in order to better consecrate himself to the Lord". (John Paul II, during the Angelus at Le Bourget, 01/06/1988). The Christian family, thanks to the grace of the Sacraments, when lived in a concrete experience of faith and love, sets itself up as a sign and reflection of the love of the Trinity and as original accomplishment and image of the Church, so that it deserves to be called "the domestic Church" [see Council Vatican II, Lumen Gentium, ("A light to the people"), n° 11]. The Christian family takes part in the life and mission of the Church, as it receives and transmits Christ’s love. It pays to God spiritual worship by sharing prayer and offering the staying together in weariness and rest, in sorrow and joy, by celebrating the Eucharist on the day of the Lord, and by walking together on its path of faith. (see CEI, "La verità vi farà liberi" ("Truth will make you free"), 1071-72). 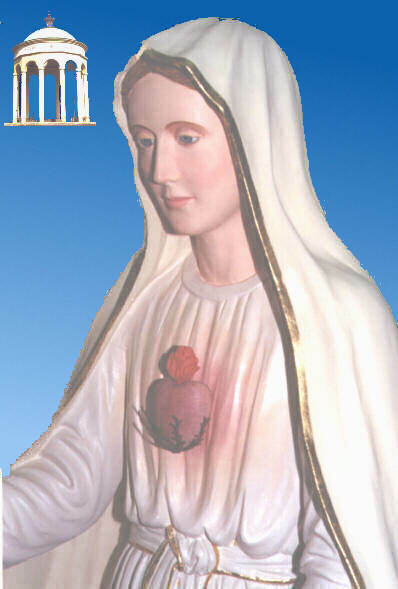 In light of these premises, the consecration of the family to the Immaculate Heart of Mary sets itself up as an effective help for those who intend to live following Jesus Christ as their model in a more faithful way. By imitating the virtues of Mary, the perfect disciple of Jesus, the consecrated family can witness God’s love in the Church and in the world. The commitment of the family who wants to live under the direction of Mary’s Heart can be divided in three fundamental points: penance, prayer, reparation. · Penance. It consists in reconciliation through Christ with the Father, with our own brothers and with ourselves. This implies that each of us must intend to avoid sin and obey God’s Law as shown in the commandments and in what the Church Magisterium teaches. Hence, the sacrament of reconciliation is indispensable as a visible sign, which enriches us with the plentiful gift of Grace and fortifies the soul of the believer who intends to live in the spirit of penance. Finally, everyone must fulfill the duties of his state, accepting also the fatigue, the pain, the incomprehension of it, and must live witnessing Christ in the time and situation he is in. · Prayer. Since here prayer is regarded in the family context, the family members must give prominence to liturgical prayer - which is made up of the Holy Mass, celebration of the Sacraments and Liturgy of the Hours - and to the unofficial communitarian prayer, which includes Eucharistic Adoration, the Way of the Cross and the Rosary. Special attention must be reserved for the Rosary: the members of the family should find the time to pray together on weekdays, and should join Mary in praising and invoking Jesus, living again with her the mysteries of salvation of her Son, and meditating them, as she does, in their hearts. The family, moreover, ought not to forget to read and meditate with proper care the Word of God. · Reparation. The Cross of Christ restores the sound relation between man and God, repairing the damage caused by sin. However "each man, in his suffering, can participate in the redemptive suffering of Christ" (John Paul II, "Salvifici doloris"). In this sense every family member can "make amends" for the sins of his own brothers against the Sacred Heart of God and the Immaculate Heart of Mary, offering, along with the eucharistic sacrifice, his good deeds, his prayers and his sorrows for the conversion of sinners. The Eucharist is at the center of this "act of expiation": yet the family, thanks to this spiritual orientation toward the Heart of Mary, can strengthen this action by the pious practice of the First Saturdays of the month. 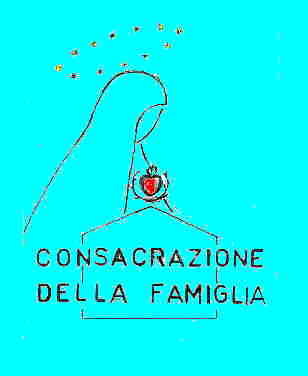 This kind of consecration concerns the family, and it goes without saying that a family consists of at least two persons. When looking into the commitment this consecration requires, it is necessary that at least two members of a family accept the contents of it, so that they can be a sign and a witness for the other members, and inspire them, indirectly, to also share this experience. In the life of every family, there can be moments of incomprehension, depression, withdrawal and detachment, moments in which this spiritual experience won’t be shared by all members. It must not happen that this particular experience becomes the cause of new dissensions: everyone must respect the freedom of the other members, offering solidarity and comprehension. Last ten days: always remaining united to Jesus through Mary. 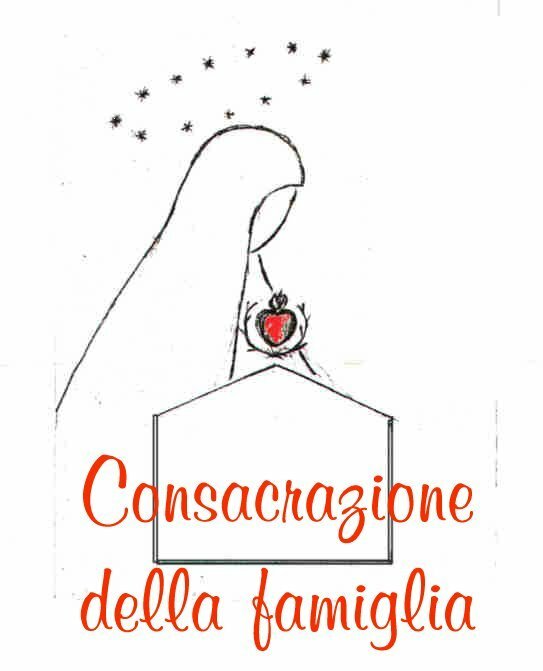 o Get a small statue or an image of the Blessed Virgin Mary, and put it in a proper place of your house, so that it can always stay there and become "the beautiful corner" of the house, where you can pray every day (see "Nuovo dizionario di Mariologia" by Stefano Flores and Salvatore Meo). o Chose a suitable day - for instance a first Saturday of the month - to carry out the consecration ceremony. o Attend Holy Mass first; then, at home, pray the Rosary, and finally recite the act of consecration. o This act of consecration can be renewed every year, or in other particular circumstances. o The faithful are free to give major solemnity to the act of consecration, provided of course this doesn’t clash with the local Bishop’s disposition. Oh Mary, dear and sweet Mother, here we are, united around you, to entrust and consecrate to you this family, which wants to belong totally to you and serve you with humility and generosity, so that all men know you and love you. We all commit ourselves to your Immaculate Heart, and entrust to you what we are, what we have, our weaknesses, our aspirations, our life. All that is in us, o Mary, we entrust to your sweetest Heart, so that you can transform it and make it acceptable and more worthy of the Sacred Heart of Our Lord Jesus Christ. Take care of our mind, our heart and our senses, so that we can never sin; sanctify our thoughts, affections, words and actions, so that we can please you and your Son Jesus. Watch over, protect and accompany this family, this little domestic church which devotes itself to you; transform it into a real oasis of peace, so that, through its testimony, it is a living sign of the presence of the kingdom of Jesus and of his Peace, which He himself has wanted to entrust to the triumph of your Immaculate Heart.